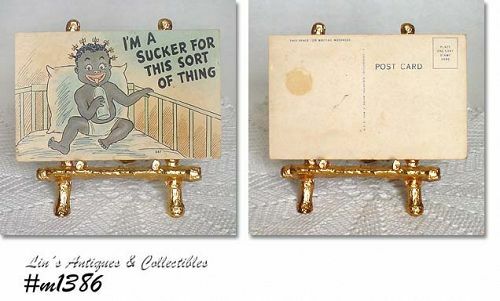 Neat Black Americana postcard in this listing! 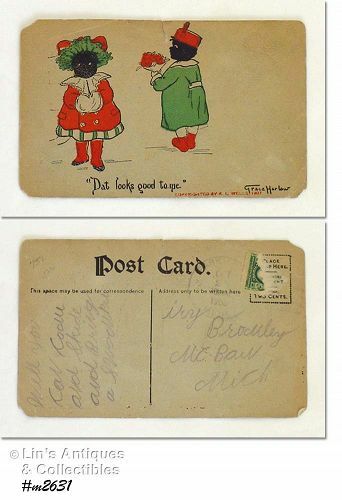 Postmark appears to be 1908, it’s faint so I couldn’t be positive. 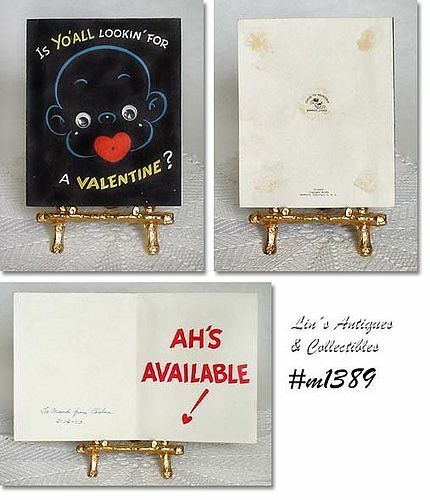 Card is in very good condition for it’s age and is as shown in photos. 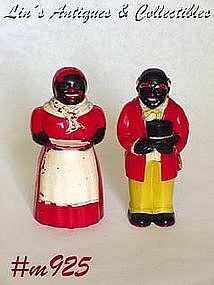 Very nice salt and pepper shaker set – the taller Aunt Jemima and Uncle Moses! Made by F & F, shakers measure 5” tall, are in very good condition, and still have their original plastic stoppers. They have minor color wear and the only “use” evidence is on Uncle – he has sustained 2 chips on his shoes. One shoe has a chip on the front side, the other has one on the back side – doesn’t effect use, he stands level but is less than perfect and priced accordingly. 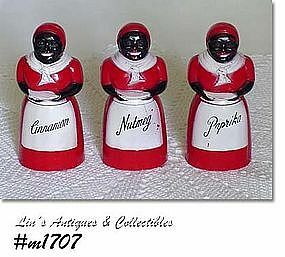 This listing has 3 Aunt Jemima spice containers made by F & F! The containers are for Cinnamon, Nutmeg, and Paprika and are in very good condition with minor color wear and two of the shakers inserts are missing. Very nice addition to a collection! 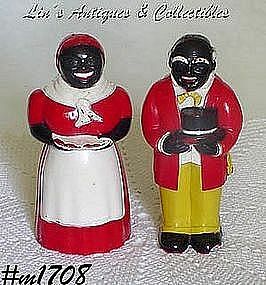 Very nice salt and pepper set – Aunt Jemima and Uncle Moses! Produced by F & F Mold & Die Works of Dayton, Ohio, these are the smaller size shakers. 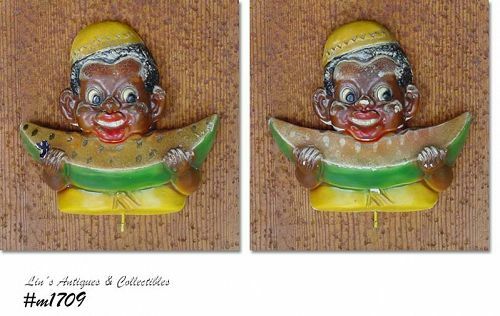 He measures 3 ½” tall, she is 3 7/8” tall, they do not have stoppers and have been used resulting in some paint loss. Neat set, very collectible, and priced to reflect paint loss! These are original F & F productions, they are NOT reproductions. 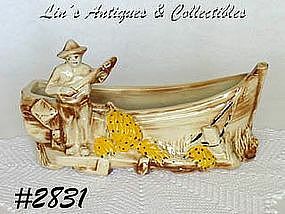 Very collectible McCoy item – the Calypso boat planter! Measures 11” long (at longest), 4 ¼” wide (at widest), and 6” tall (at tallest). Planter is in excellent condition with only evidence of “use” being minor cold paint loss – that’s it!! Has a glaze bubble that has a 1/8” pop on lower front – it is production and not detrimental. Difficult to find McCoy item! SUPER NICE ITEM! 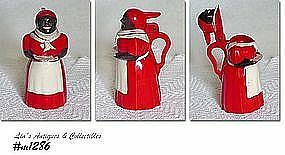 THIS IS THE AUNT JEMIMA SYRUP PITCHER MADE BY F & F OF DAYTON, OHIO. 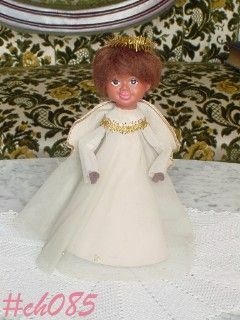 MEASURES 5 1/4" TALL AND IS IN EXCELLENT CONDITION -- HAS MINOR PAINT LOSS ON THE PLATE SHE HAS IN HER HANDS -- THAT'S IT!! AND YES IT IS ORIGINAL -- NOT A REPRODUCTION. 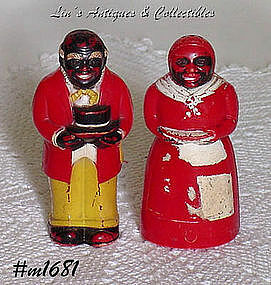 EXCEPTIONAL AND DIFFICULT TO FIND MOSES AND MAMMY CREAMER AND SUGAR SET MADE BY F & F OF DAYTON, OHIO. BOTH ITEMS ARE IN EXCELLENT CONDITION -- MOSES HAS A SMALL AMOUNT OF YELLOW SHOWING AT THE HEM OF HIS RED COAT -- THAT'S IT!! REALLY NEAT SALT AND PEPPER SHAKER SET! MADE BY F & F, THIS IS UNCLE MOSE AND AUNT JEMIMA. HE'S THE PEPPER, SHE'S THE SALT AND BOTH MEASURE 5" TALL. THEY HAVE NO CHIPS OR CRACKS. DO HAVE MINOR COLOR LOSS THAT ADDS TO THEIR APPEAL. THEY HAVE LOST THEIR STOPPERS. MARKED: F & F, MOLD AND DIE WORKS, DAYTON, OHIO, MADE IN USA. CUTE! UNUSUAL TREE TOPPER! NOT NEW BY ANY MEANS, THIS TREE TOPPER IS AN ANGEL OF COLOR. HAS PAPER LABEL ON BACK: ALL NEW MATERIAL, JAPAN. MEASURES 9" TALL. 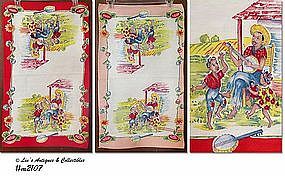 VERY UNUSUAL ITEM THAT HAS BEEN A PART OF MY VINTAGE CHRISTMAS COLLECTION FOR MANY YEARS.